forever in one piece I pray you stay. like thrift, DIY, and our globe. a good life on this earth for us all. I’ll be trailed by this 3RR flag. Whatever, poetry and music aren’t my strong suit! The point is that after many months of “collaboration,” ie mooching different parts and services whenever the opportunity arises, the 3RR flag is finally complete. Until it malfunctions again. The flag is my way of attracting attention to my cause without being pushy, and as such plays a key role in making my trip into something more than just an extended vacation. A little grandiose, perhaps, but people seem to like it. And now, it’s totally finished and ready to be paraded around shamelessly. I’d like to sincerely thank all the people who have helped me out in various ways. Your contributions of inspiration, materials, and technical skill have led to the creation of something that will be seen by hundreds of thousands, or perhaps more. Even if only one of those people approaches me out of curiousity and comes away with a slightly different perspective, your generosity will have been transsubstantiated into a tangible good for the world. Nice shot! Your influence shall be felt around the globe. 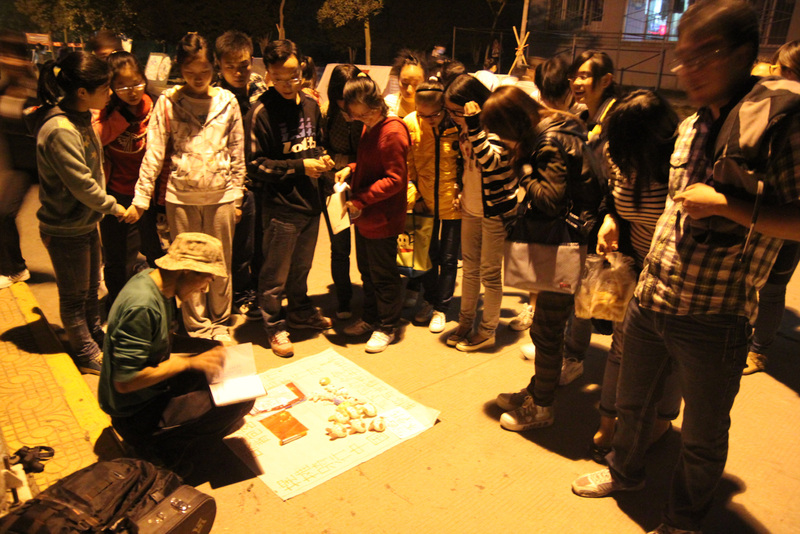 (October) Thanks to all the fifty or more college kids in Xinyang who surrounded me and asked serious questions about the good life, making me realize that I really wanted a way to share my beliefs, themes, and passions with everyone I meet. And to Achuan, my and Mingyu’s cycle partner for ten days, who dragged us along to the college to socialize and hawk goods. (November) Thanks to Tina at Toucheng Leisure Farm, who cut me a fresh piece of bamboo to use as a pole. I’ve since lost and replaced that pole numerous times, but the gratitude remains. 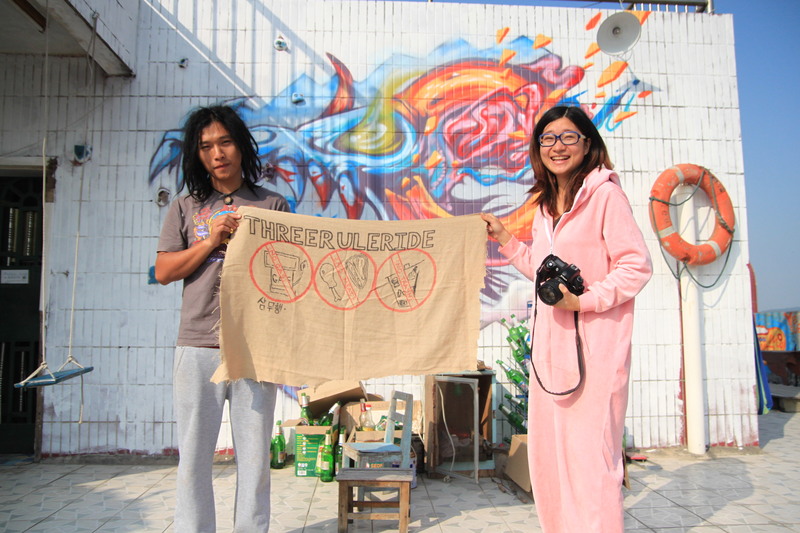 (January) Thanks to Michelle, whom I met at Nan’ao Natural Farm, for the cloth. The classy bamboo holster is there on the far right. 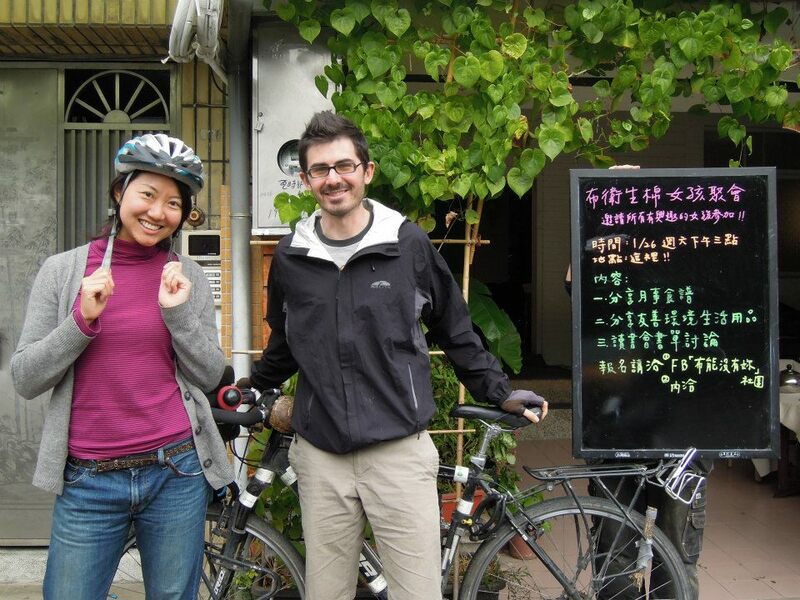 (February) Thanks to Keith and Janet, my couchsurfing hosts in Xiamen/Gulang Yu, for the markers and design help. (Feb) Thanks to Wieslaw the Polish dude, a CS guest at J and K’s, for the help with the letter design. 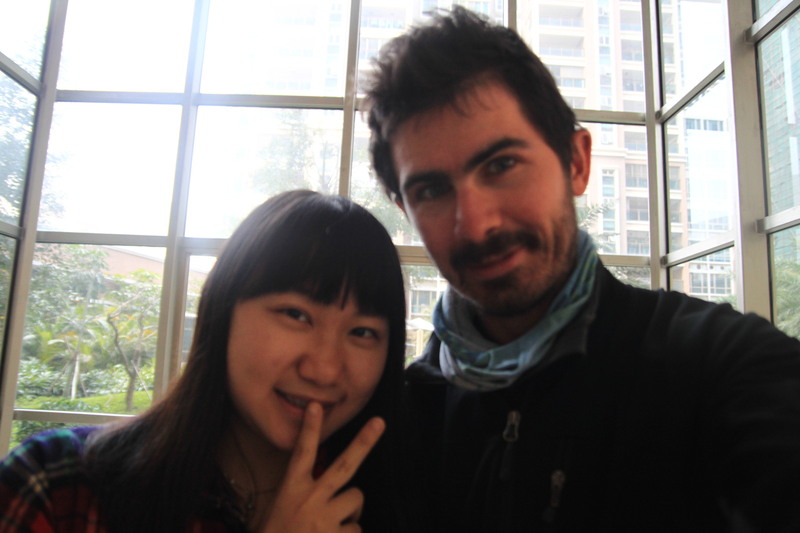 (Feb) Thanks to Winky, another Nan’ao friend, whom I met again in Shantou on the mainland. She took me to a seamstress to get some repairs, reinforcements, and other modifications done. 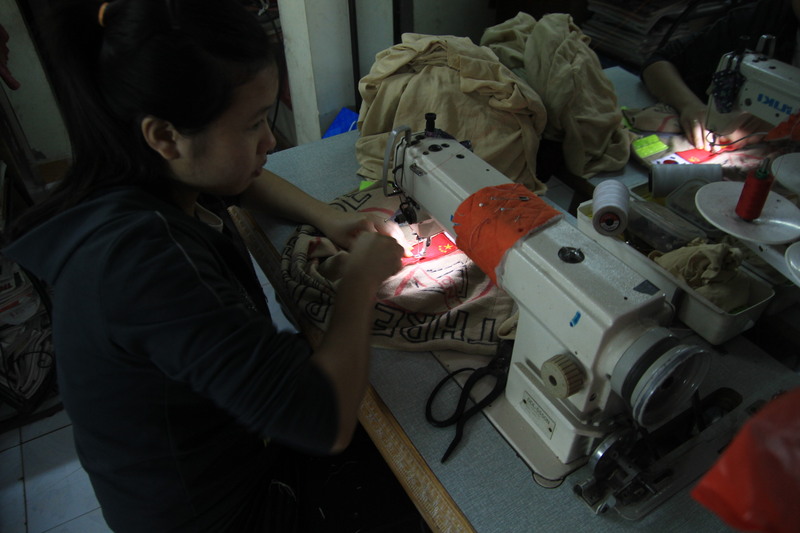 (March) Thanks to the Vietnamese seamstress who attached my first three mini-flags. 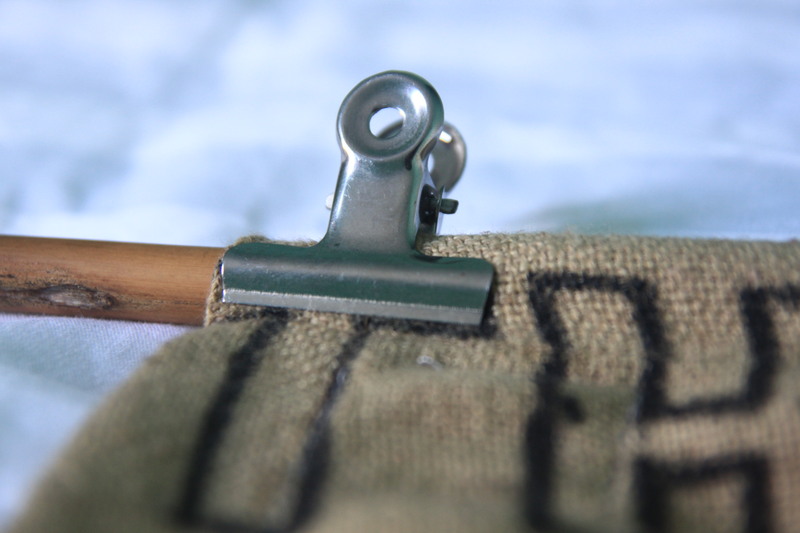 …for the clips that keep the flag from flying off of the pole on every long descent. Actually, I lost the clip he gave me when I lost my last flagpole, but I found some more. 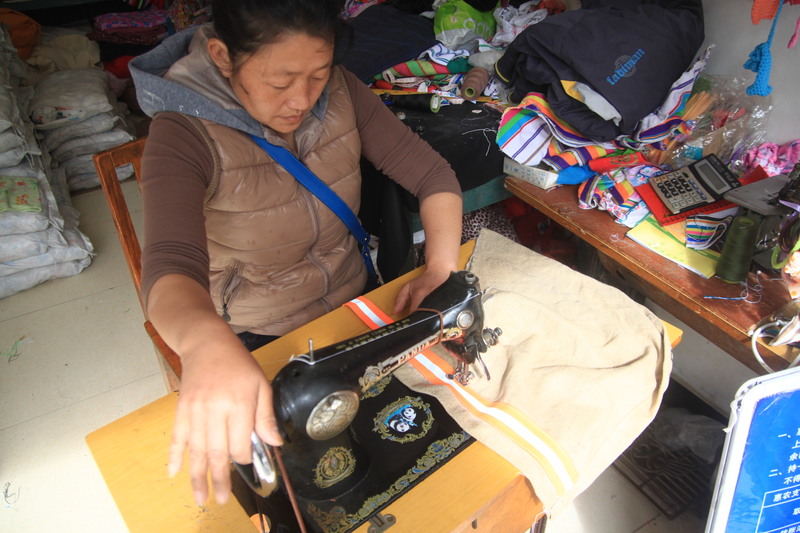 (May) Thanks to this seamstress in Binzhongluo (and her pedal-powered sewing machine!) 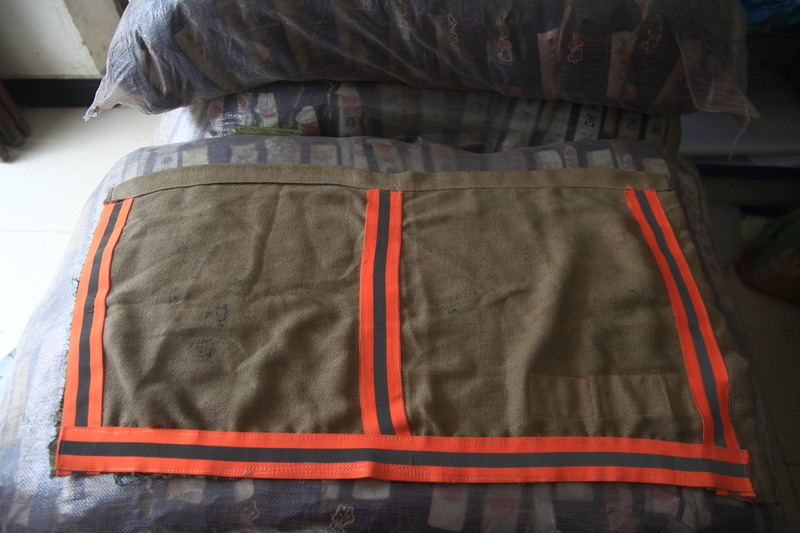 for putting on the final touches: reinforcing the edges with what used to be my reflective suspenders. The flag had been stashed in my backpack for the last month on account of the way the wind wasy causing its borders to fray. No more! Extra strong, Extra safe! The final product. Just in time for me to leave the only country where I can actually explain anything in the native language. So far, unfortunately, very few people have actually been able to guess what the symbols mean. I thought I had designed them to be pretty straightforward and universal, but it seems that almost nobody here gets the idea of conscientious objection to such things as meat, gas and trash. Or maybe to anything at all?. Is it a lack of knowledge about the damage these (and other things) do to individuals, communities, and the environment? Or is it just that things don’t often get represented this way? Now that I’ve got the flag, I guess figuring out how to talk to people about it is the next step. This entry was posted in "Spirituality", Characters and Friends and tagged Flag. Bookmark the permalink. 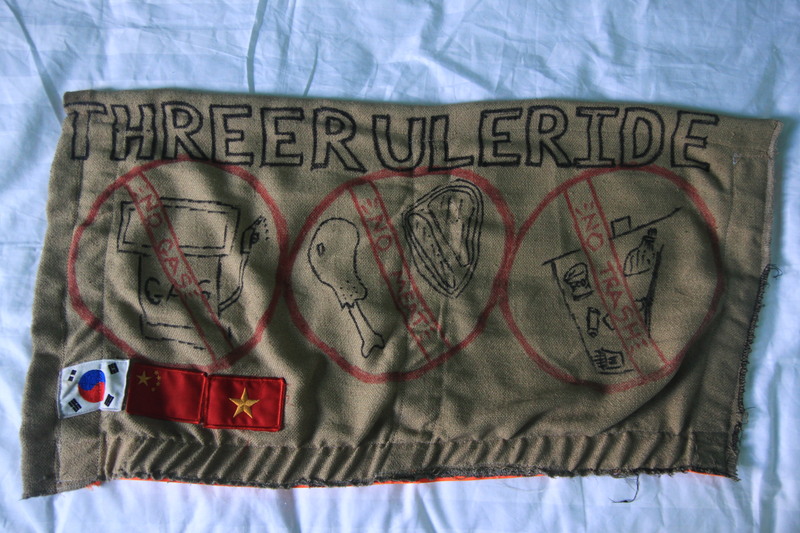 Threer Uleride. Huh. Guess I just don’t get it.